Auction Factory offers a variety of email notifications which can be sent automatically for different actions within your website. Go to Mail Settings page from the component control panel to enable, disable or edit them accordingly. Bidder - bid lost : sent to bidder when someone else won the auction. Seller - BIN auto accepted: sent to seller when a BIN bid automatically accepted for his auction. Seller - BIN bid waiting approval: sent to the owner of an auction when a BIN bid was placed on their auction and it's now waiting his approval. Watchlist - BIN bid accepted: sent to followers (watchlist) when a bid was accepted on an auction they were watching. Watchlist - auction canceled: sent to users when an Auction that they were watching was canceled. Bidder - Outbid Notification: sent to the bidder when his bid gets outbid. Seller - reserve price not met: sent to seller when an automatic auction expires and the reserve price is not met. Admin - auction report: when an auction is reported, admin gets notified. Bidder - suggestion accepted: notify the user who suggested an auctions' price that his suggestion got accepted. Seller - suggestion reminder: notify seller about waiting for suggestions on his auction. 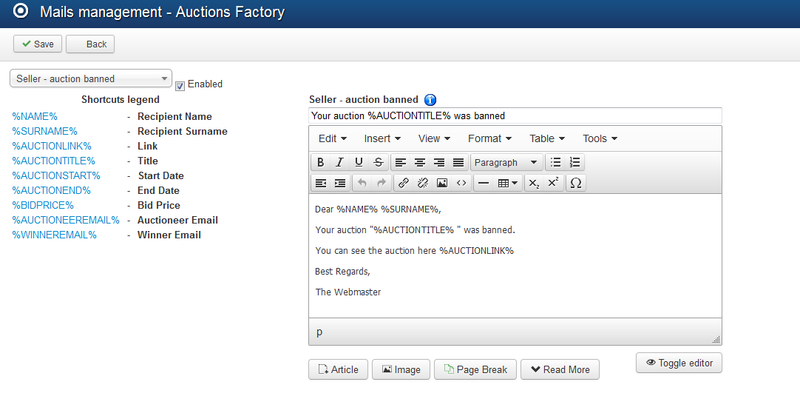 Seller - auction banned: this notification is sent to seller when his auction gets banned by the administrator. You can enable or disable just some of the messages by clicking on each of them from the drop-down menu and checking or unchecking the checkbox found next to them If you want them all to be activated be sure to verify them one by one! (!) The CRON has to be configured and running regularly in order for all the notifications to be sent. 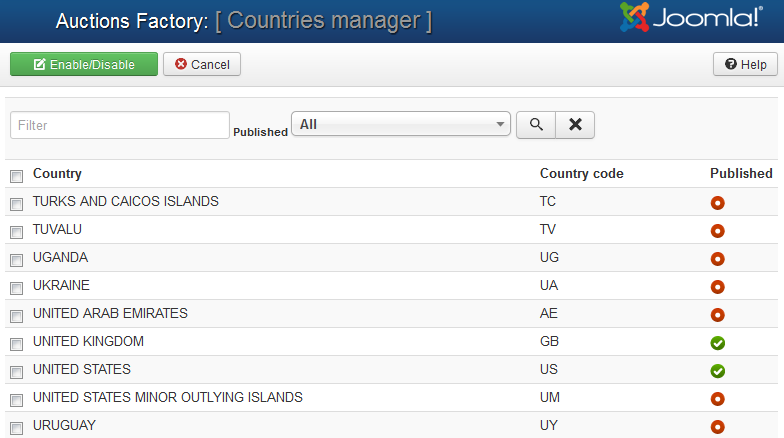 Countries Manager page allows you to set up which countries are published and which not. A filtering system is available that will help you search for a certain country. On frontend, users will have only the enabled countries to choose from when setting their profiles. You can create a ".xls" file containing a list of all the auctions data available on your website or to import a ".csv" file adding additional auctions. With Import Auctions from CSV, you can import data as a bulk upload, which will append the data to your existing database. This will help, for example, populating your database much more easily, uniting the existing records which are kept in different formats. Having a .zip file containing images of these auctions can also be uploaded the same way, using the provided field. (!) For sample data and other info about the BULK import feature, please check this page. You can purge the auctions that ended in order to keep the database clean by clicking on the Purge Closed Auctions button. By clicking on Backup Auctions and Images you will see the path where the ".zip" file will be saved. To proceed creating the backup you need to be sure the path is Writable. Here you can also choose to download the file on your HDD and delete the one saved on the server after the download occurs. To restore one of the created backups go to Restore Auctions and Images and select the file from your HDD. You can verify the path where the restore will occur and choose if you wish to Overwrite Existing Images when this happens.